This is one of the places that my husband wanted to take me while we're in LA area. We went to a branch on Pico Boulevard was the one Obama paid an unscheduled visit on October 24, 2011, which I learned after coming back to NY. He ordered a menu #9 called "Country Boy," which is 3 wings with a choice of waffle, potato salad or french fries, and now it's called "Obama's Special." 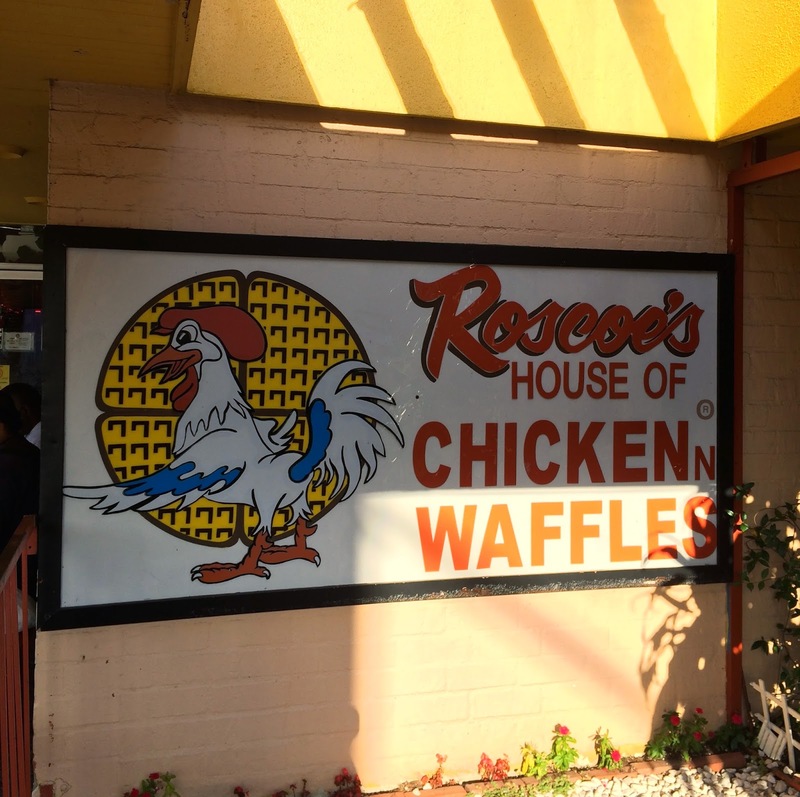 The full name of the chain is "Roscoe's House of Chicken and Waffles" founded by Herb Hudson, who is from Harlem, in 1975. 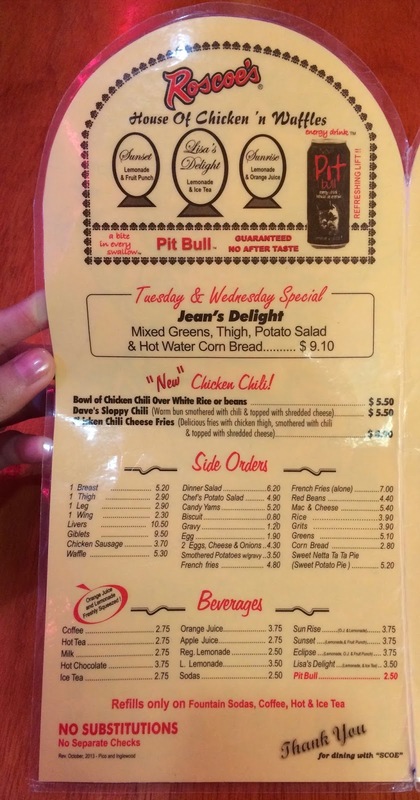 It's best known for serving soul food, chicken and waffles, on a same plate but separately like the name shows. 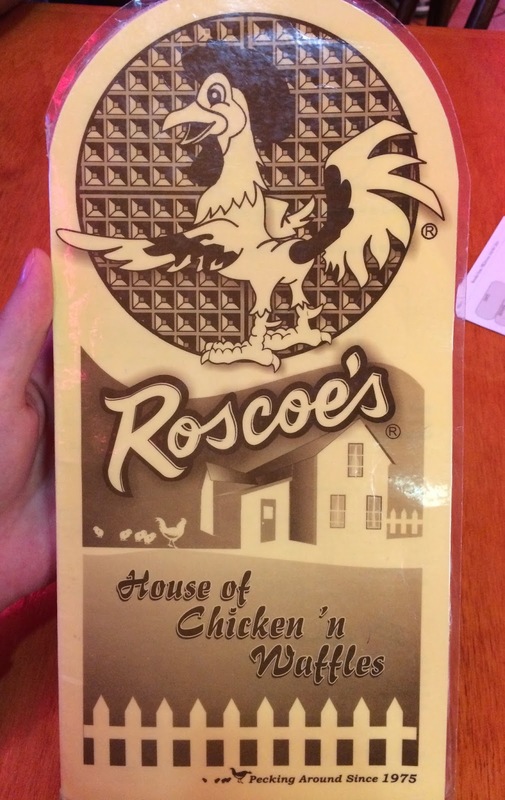 The Los Angeles Times refers to Roscoe's as "such an L.A. institution that people don't even question the strange combo anymore," according to Wikipedia. We're there around 6 or 6:30 PM with a friend of my husband, and the restaurant was crowded but we could seat quickly. This branch was in a rough area so that there's a guard in the parking lot. 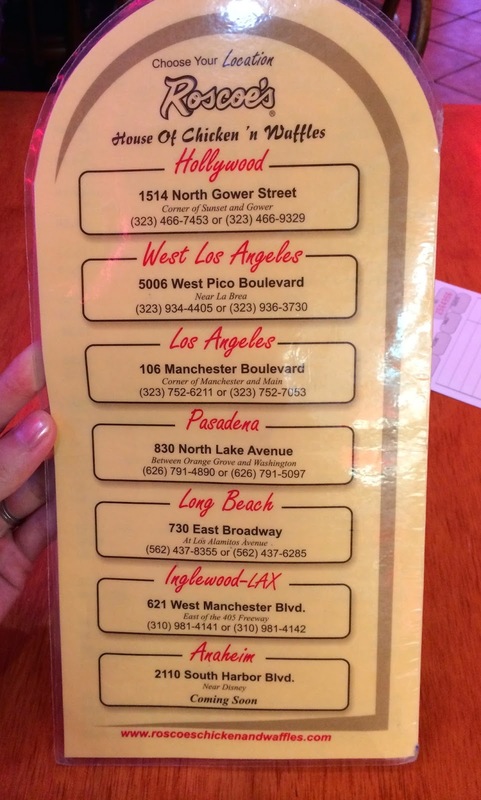 The waiter who took care of was funny and caring, and he asked us if we know the menus. If my husband and his friend hadn't explained to me the menus, the waiter would have taught what's famous I assume. On #9, you can see "Obama's Special." 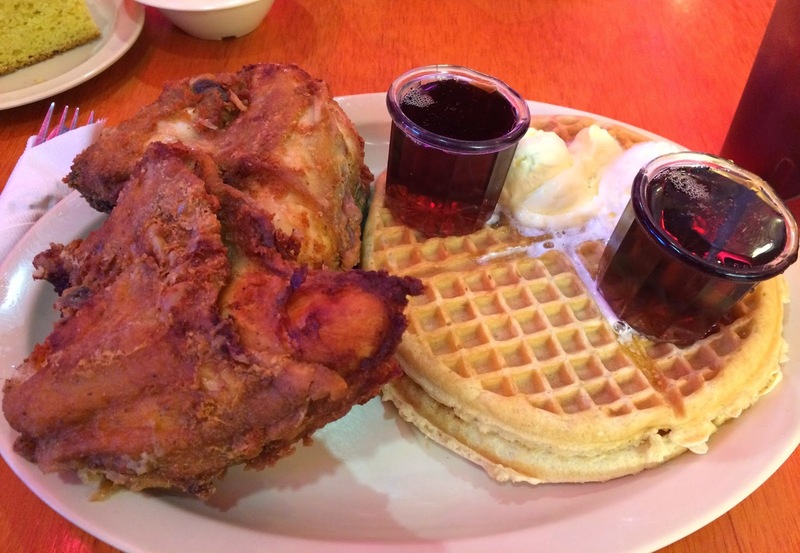 My husband I got #1 "Scoe's 1/4 Chix prepared southern style, 2 waffles, our own private mix." It's a quarter of fried chicken breast served with waffles with butter and maple syrup. His friend ordered corn bread, waffles and mac & cheese. 2 large pieces of fried white meat and 2 waffles (about 20cm / 7.8 inch. in diameter) with 2 mini jars of maple syrup poured to the very top. 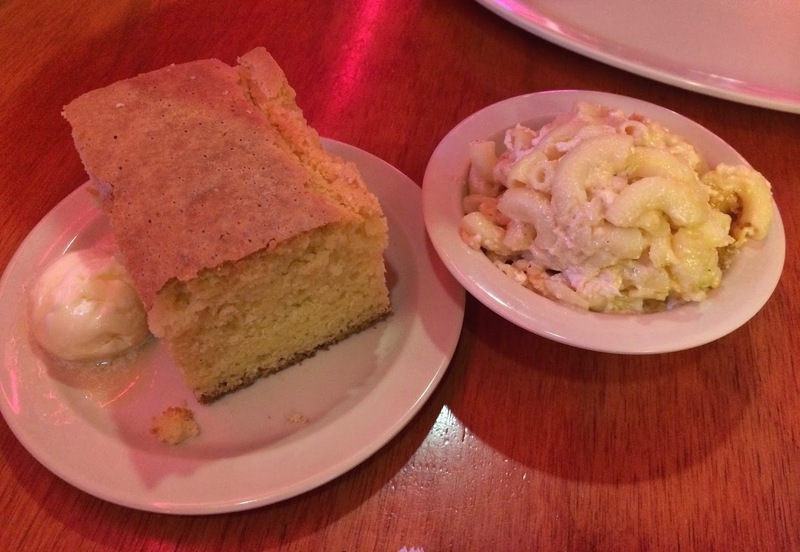 On the left, it's cornbread and mac & cheese on the right. Cornbread was fluffy and dried (in a good way) so that it absorbed syrup well. Mac & Cheese was thick but less cheesy and creamy than Kraft, so I felt like it's a macaroni salad made with cheese instead of mayonnaise. Chicken was moist inside and very thick. 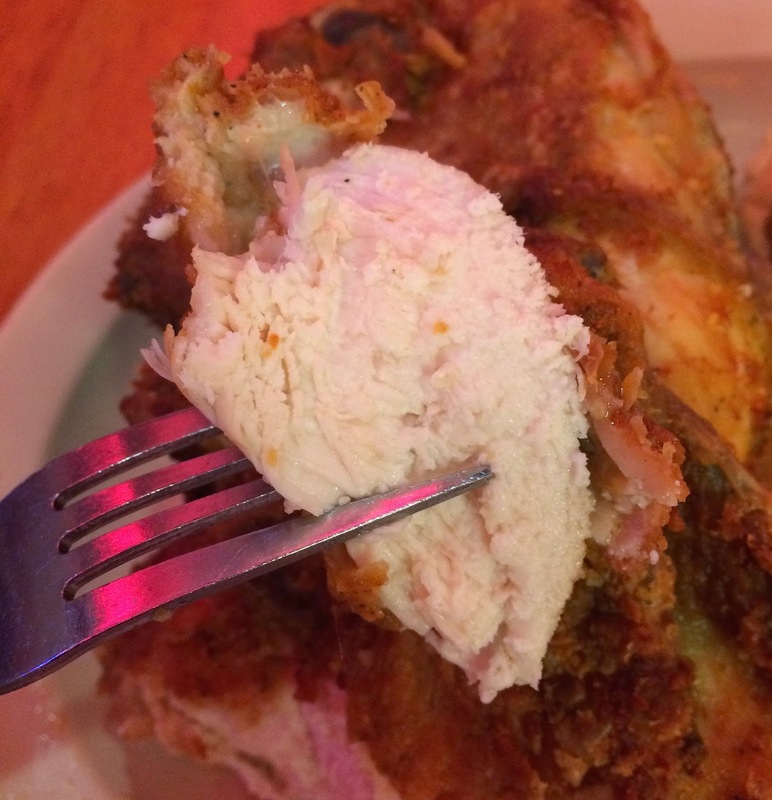 The batter was very flavorful and seasoned well like KFC, but personally I thought it's saltier and it tasted simpler as if they used less complicated mix of spices. 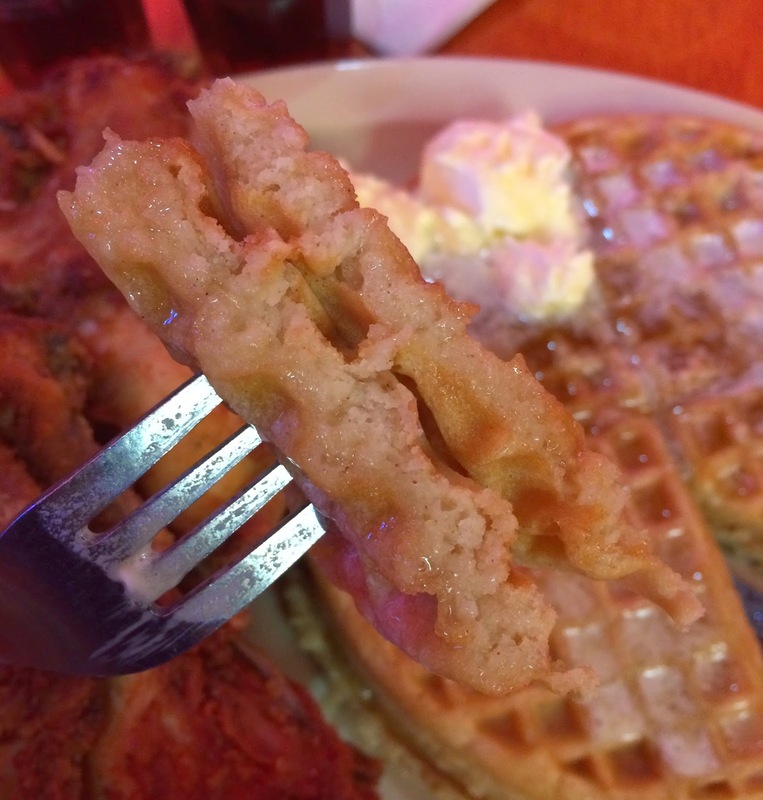 Waffles were thin, not chewy, and unsweetened as it's supposed to be eat with the chicken. With butter and maple syrup, it tasted like regular waffles to me. Finally I tried them together, the famous "chicken 'n waffles." Syrup-absorbed waffle and butter plus seasoned chicken, it's pretty complex to me. It wasn't bad, but it's definitely something I've ever had before. I can eat meal and sweet back and forth, but not mixed in my mouth, so it's a very unique combination. 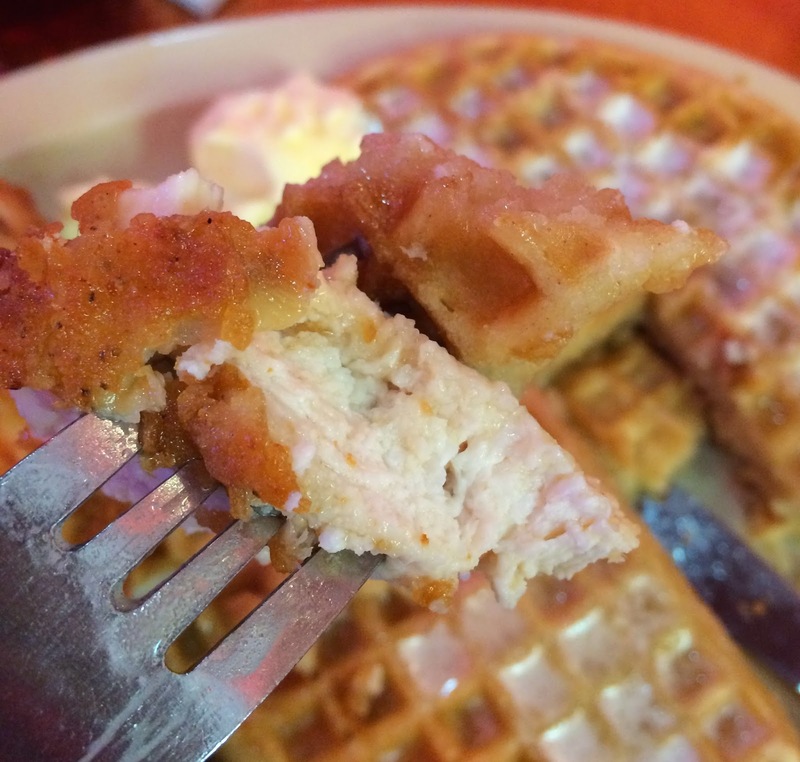 Yet, I couldn't get over the popular combination, which was a confusion to me, I ate chicken and waffles separately. The volume was so big and I could only eat 1 and half fried chickens and a half of the waffles. The plate could serve 2 persons.